Glucerna is a brand of nutritional shakes and snack bars made by Abbott. They are made primarily for people with Type 2 diabetes. Glucerna shakes and bars are made with CARBSTEADY®, meant to slow the release of carbohydrates, which helps lessen blood sugar spikes. 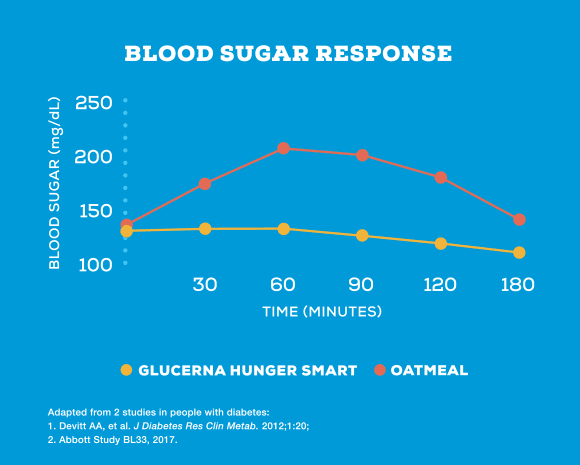 Glucerna has been clinically proven to keep blood sugar levels more steady, over three hours, than oatmeal alone. When you have Type 2 Diabetes, carbohydrates in your meals and snacks are especially concerning. They raise blood sugar levels which can cause complications like blurry vision and even nerve damage. With CARBSTEADY® by Glucerna, blood sugar spikes are much smaller and almost nonexistent. This can lessen your side effects of having a blood sugar spike following a meal. 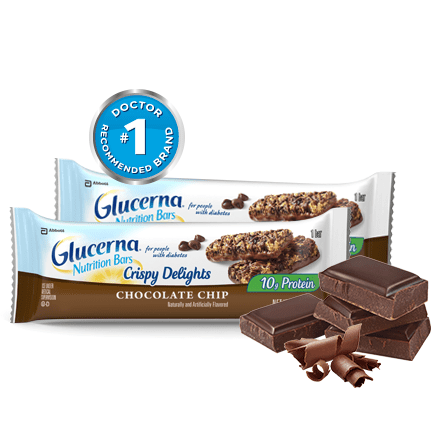 All of Glucerna shakes and snack bars have a low glycemic level and less sugar than most meal replacement drinks and snacks. The shakes and snacks also have a lower calorie count, so by replacing a meal or snack each day with Glucerna, you may lose weight overtime. There is also more protein in their products, 15 grams, compared to other meal replacement shakes which contain 10 grams or less. One Glucerna shake contains about 200 calories, only 5mg of cholesterol, 15 grams of protein, 380mg of potassium, and about 200 grams of sodium. Other nutrients include: calcium, vitamin D, vitamin A, vitamin B-12, iron, magnesium, and folate. In a double blind study of elderly patients, ages 71 to 78, Glucerna shakes were preferred over a competitor’s brand. They graded each shake on appearance, smell, body, sweetness, aftertaste and taste. The patients overwhelmingly chose Glucerna shakes over the competitor’s. Glucerna had an overall better flavor said one participant. 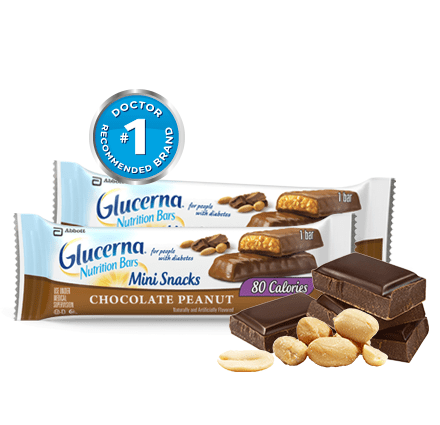 You can find Glucerna products at your local pharmacy, grocery store, or online. Prices start around $1 per shake and 40 cents per mini snack pouch. Prices are so affordable, why not give them a try? Remember to always consult with your doctor before starting any meal replacement products. It’s important to eat a healthy diet high in lean protein and low in sugar. Always check your blood sugar levels before and after a meal and take your medication as directed. Now that we’ve learned a little more about Glucerna, let’s look at their product line to see what might fit into your diet best. 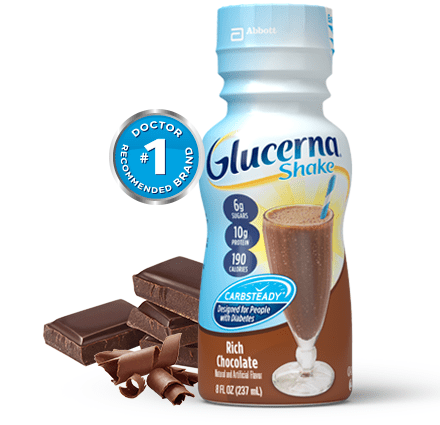 This original Glucerna shake contains 190 calories, 10 grams of protein, and only 6 grams of sugar. It comes in chocolate, vanilla, strawberry, and butter pecan flavors. You can use this shake to replace a meal you would normally skip, like a skipped breakfast. Or use the Glucerna shake to replace an unhealthy meal choice, instead of fast food opt for a shake. The original shake also contains 3 grams of fiber, 500mg of potassium, only 5 mg of cholesterol, and no trans fats. One shake provides 100% of your daily vitamin C recommendation. If you’re planning on replacing a meal, then the Hunger Smart shake is for you. It’s loaded with 15 grams of protein and 5 grams of fiber. 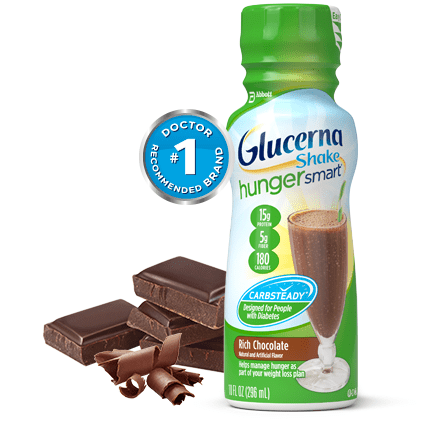 Coming in at 180 calories, the Glucerna Hunger Smart shake can help you lose weight with regular exercise and a balanced diet. The flavors of this shake include chocolate, vanilla, and strawberry. A 10 fl oz. serving contains 8 grams of fat but no trans-fat, 580mg of potassium, 16 grams of carbohydrates, and 6 grams of sugar. The Hunger Smart shake also includes 100% of your daily vitamin C recommendation as well as 40% of recommended daily vitamin D.
Looking to improve your heart and immune health along with managing your diabetes? Then try the Advance shake. If comes in two flavors: chocolate and vanilla. One serving contains 200 calories, 10 grams of protein, and 6 grams of sugar. This shake contains less than 5 mg of cholesterol and 35% of your daily recommended Molybdenum. Molybdenum has been shown to reduce inflammation in the body. It has also been linked to improving blood sugar levels in those with Type 2 diabetes. This shake is an excellent choice to replace a meal with. 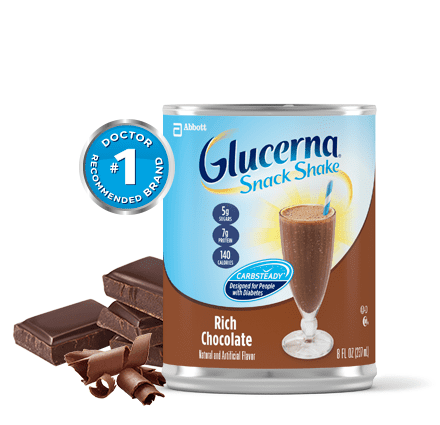 The Glucerna Snack shake is perfect to replace an unhealthy snack during the day. Or just have it as an additional snack to fill your body with 26 vitamins and minerals. The snack shake comes in chocolate and vanilla flavors. It’s got 140 calories, 7 grams of protein, and 5 grams of sugar. There are no trans fats and less than 5 mg of cholesterol. This shake is an excellent source of vitamin C and Chromium. Chromium has been linked to lower blood sugar levels, so it is perfect for Type 2 Diabetics. This snack bar helps to manage hunger. They are packed with 10 grams of protein in one serving. The bars have 150 calories and 4 grams of sugar. The two flavors of bars include: chocolate chip and peanut chocolate chip. One serving contains 3 grams of fiber and 100% of recommended daily value of vitamin E. Vitamin E helps to improve heart disease and reduce nervous system disorders. These mini bars are loaded with 21 vitamins and minerals with only 80 calories. You have three flavor choices: chocolate caramel, chocolate peanut, and oatmeal raisin. With only 3 grams of sugar they are a great snack replacement. One serving contains 3 grams of protein. Some helpful vitamins and minerals include: vitamin C, vitamin E, selenium, and molybdenum. Glucerna shakes and bars provide an excellent source of vitamins and minerals without an abundance of calories or sugar. People with Type 2 diabetes can choose from several different flavors like chocolate, vanilla, butter pecan, chocolate peanut, and oatmeal raisin. With CARBSTEADY®, Glucerna products slow the release of carbohydrates, which helps lessen blood sugar spikes. Remember to always consult with your doctor before starting any meal replacement products. The shakes and the bars are very affordable and taste great. 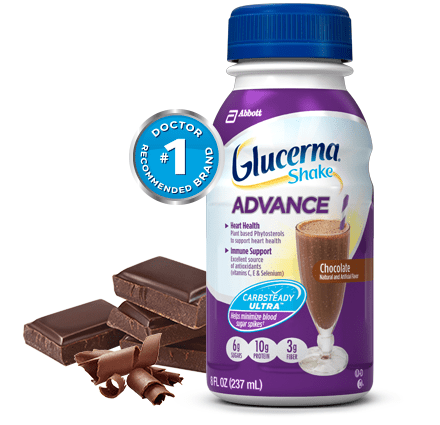 The double blind study showed that Glucerna brand is preferred over the leading competitor’s shakes. Try them for yourself, monitor your blood sugar, and see if Glucerna helps lower your blood sugar readings. And by replacing a meal or snack each day with Glucerna, you may lose weight overtime. Glucerna is a terrible product to advocate use for Diabetics. Did you bother to read the ingredients? Corn Maltodextrin, Whey protein, sucromalt, fructose. All of which cause blood sugar spikes. Corn Maltodextrin alone is high glycemic and will spike blood sugar. Add the others and you have a very volatile cocktail that will raise blood sugar dramatically. Mark, what would you recommend?